On horseback or with a donkey! On horseback or with a donkey ! 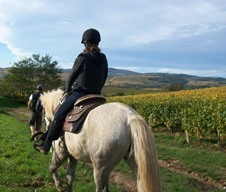 Southern Burgundy offers riders wishing to go on a trek along sign-posted itineraries, the "Pistes vertes". Created with the initiative of the CDTE 71 (Departmental committee of Equestrian Tourism), these routes borrow primarily existing natural paths. On these courses, or nearby lodgings, guest hosts, hotels, restaurants, camp-sites, propose equestrian services. Halts bivouac with water points and other services for the reception of the riders and their mountings are at disposal in the old stations of Givry, Saint-gengoux-the-National and Cormatin.